Other reports: 2016, 2015, 2014, 2013, 2012. 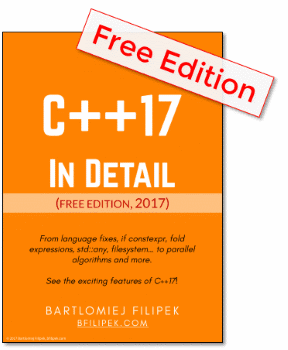 "Surprisingly, C++11 feels like a new language" - C++11 FAQ from Stroustrup. So far I did not code using C++11 much. I have read a lot of articles and watched several presentation on that case. I need to learn quite a few new techniques and concepts to fully use the new standard. Fortunately this seems to be quite easy and nice journey. Hope I will be soon able to update my project to use new Cpp. All in all I can agree with the quote above. Idea of this code was grabbed from one of Herb Sutter's lectures. This short piece of code shows quite silly thing. But it C++98 you would probably wonder whether to use pointer or maybe a reference, or maybe return by argument... using value type would have been too expensive for sure. But now with "move" semantics this piece of code should be as fast as when using pointers! Another advantage is that you simply do not have to bother, just use return by value. Under the hood string will not be copied but actually moved - using a move constructor. This, I think, is quite a fresh idea that makes Cpp more user-friendly. What about some more examples? // isn't that much simplier and so obvious? We could add some more source code here. But the point is that the language and its syntax 'caught' modern standard and should be a bit better to use. 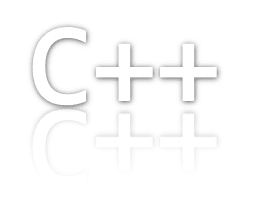 Let us take a look on some motivations that are base of of working with C++. close to hardware - you can do almost everything you want, but it comes with some price - you must know what you are doing. performance and control - you have control over the hardware and your data. If you want you can use garbage collector but this is your choice. memory - decide where are your objects stored. Much simpler with new smart pointers and when learnt properly you can use them as working with some managed language. trust the programmer - C++ is hard to learn, but when you know it you have a great power over your code. On the other hand it is quite simple to ruin the code and make the software more buggy. Fortunately C++11 is not the final version. After watching "The Future of C++" I see that C++ committee is and will be working pretty hard to give us updates and new standards. We needed to wait 13 years - between C++98 and C++11. But now a new major version of the standard is planned for 2017, before that several minor releases are planned as well. Another thing is that the "Standard C++ Foundation" was created. Its official site is isocpp.org. Now we can get all the knowledge from single place. Before that news, standards and tutorials were scattered across the net. adaptation - new standard is cool, but even now we do not have compilers that fully support it! After compilers programmers need to adapt. This will take years. You can create your small projects with new standard, but for large companies with huge projects this will definitely take some time. learning - as said before - Cpp is quite hard to learn. New standard improves situation a bit, but still when you want to have a C++ job you have to know the 'old' standard. This is not easy and people will probably chose simpler languages. low level - it is great that we can create almost everything in Cpp, but is this really fastest way of doing that? Sometimes you wonder too much about the internal stuff before writing the code, this takes some time and can create bugs. tools - syntax and the structure of the language is very complicated and there is not so many good tools that improve coding. Although there are lot of powerful refactoring tools for C# and Java there is only a little for C++. Even IntelliSense and other code auto-completion tools even now are quite buggy and work worse than those we can find in .NET for instance. Overall tools makes learning and living with Cpp much harder that it should be. standard library - although there is standard library for C++ it is not that big as for Java and .NET. We need to use some third party software and that sometimes increases overall production time. With the new C++11 the standard library gets bigger, so maybe this will improve that situation. For a defence of C++ we need to consider that C++ gives us a lot of power, a lot of native power. But that comes with a cost. It cannot be used for all problems and maybe for your particular problem C# or Python would be much better. Herb Sutter - (Not your father's) C++ - short (45 min) presentation about current status of C++ and comparison with "managed" languages. C++ 11 vs C++03 by Alex Sinyakov (pdf) - lots of slides with comparison between new and the old version of standard. This is pdf stored on dropbox, so this link can be inactive in some time.